The multiple benefits of reducing nutrients to our State’s waters include reduced algal blooms, improved aquatic habitat for fish and wildlife, and reduced costs for treating drinking water. A rub, however, with these benefits is that efforts to reduce nutrient pollution are costly. For example, in 2010 the state estimated that for it to complete the implementation of the nutrient plan to clean up Falls Lake, it would cost nearly $1.5 billion. Why the high cost for Falls Lake? There are two main drivers. First, the State’s pollution reduction plan is ambitious. It calls for reductions of 77% in phosphorus and 40% in nitrogen – greater than any of the State’s previous plans for other water bodies. The second reason for the high cost is that some sources cost more to reduce than others. 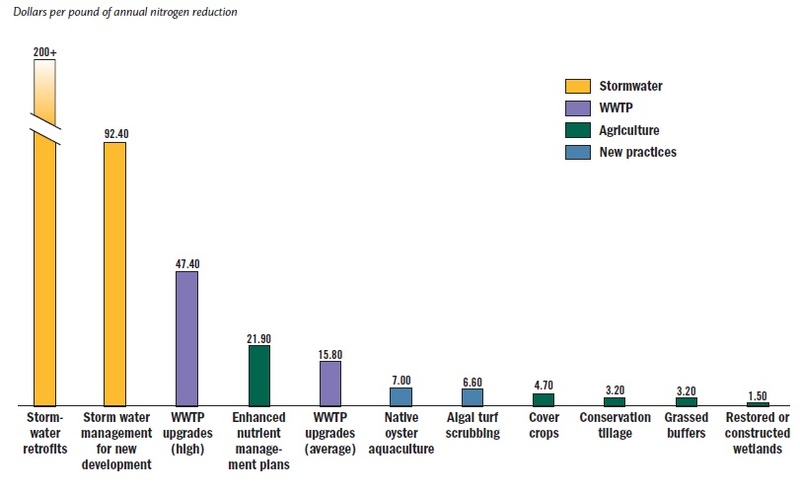 The figure below helps illustrate cost differences for nutrient reduction measures. Some practices such as the retrofitting of stormwater management measures cost more to reduce a pound of nitrogen than other practices (e.g., the restoration of riparian forest). This, combined with the State’s Clean Water Responsibility Act of 1997, which requires nutrient sources to be reduced “in a fair, reasonable and proportionate manner” contributes to the high price tag for the Falls Lake nutrient strategy. I’ll address measures to tackle these costs in a future post.